As I said in my 2010 report, “In important and very real ways, South Africa’s winemaking history is one of the youngest on the planet. A modern industry emerged only with the fall of the apartheid regime.” That was a mere 20 years ago, and it is fair to say that over the two decades since South Africa’s industry has been unusually dynamic. From plantings of new grape varieties to breaking virgin ground in brand new growing regions, the industry is being re-shaped and re-defined. There has been – and continues to be – a drive to refine the wine industry and establish South Africa’s place on the world stage. There are many issues that need to be grappled with and problems that need to be solved. Outgoing President of Wines of South Africa, Su Birch, is just one key figure who is very concerned that 60% of South African wine coming to the UK currently arrives in bulk tankers to be bottled here, thus depriving South African workers of jobs and having a dampening effect on the value of each bottle sold. Then there is the problem of leaf-roll virus, endemic in the vineyards of the Cape and problematic for quality. What to do about Pinotage is another topic always in the background – is it a grape variety to be celebrated or censured? It remains as controversial as ever. The challenges of how South Africa should compete in a world overflowing with wine are very real, but they are certainly not unique. So it is more interesting to concentrate on the positive developments, the pioneering spirits and the unqualified successes that will undoubtedly point the way forward. Pictured right is a fine example: the biodynamic vineyards at Waterkloof winery being worked by horses, where social responsibility and care for the environment are critical elements in the success of one of the Cape’s model new wine businesses. I found a real energy about the South African wine industry on this visit. Yes there is nervousness about the global recession and trading conditions, and yes I could detect a slight feeling of uncertainty amongst many winemkers as they try to pin-point exactly which path to take. But the flip side of that is a palpable sense of renewed energy and sense of purpose. There’s a quietly growing confidence in a product that is improving fast, and the fruits of their labours are being appreciated by more and more people around the world. My 2013 tour took in both the long-established quality wine regions of Constantia, Stellenbosch, Paarl and Franschhoek, as well as the more recently developed or improved regions of Hemel en Aarde, Swartland, Cape Point and Elgin. Here are my notes from visits to a number of different regions and dozens of the Cape’s most interesting producers. Profiles of each, plus tasting notes on their wines follow. Will the small town of Riebeek-Kasteel one day be the ‘new Franschhoek’? For some of the local winemakers that is the dream, for others it’s a nightmare scenario. Franschhoek with its Relais & Châteaux hotels, extraordinary array of five-star dining options and vibe of exclusivity is a wonderful place for the well-heeled wine tourist, but it is a world apart from this sleepy rural town with its slightly hippy feel. A little further from Cape Town than Franschhoek but still within day-trip reach, there are just the beginnings of organised wine tourism, but Riebeek-Kasteel remains true to its origins: this is where Cape Town’s 60s flower-power children settled. An alternative spirit still exists in the galleries, craft and coffee shops that line its little main square – and amongst the winemakers living and working here. Swartland’s estates are almost exclusively family-owned and run by couples with young children. Clearly the carefree and casual lifestyle appeals as they plough a very singular and seemingly united path. On both of my visits the region’s winemakers came together to eat, taste and enjoy their wines with me and with each other. The Swartland story began with Charles Back’s Spice Route brand, the first to label wines from here. Back’s winemaker was a young Eben Sadie who is today one of the most respected figures in the Cape wine industry, his eponymous Swartland label producing some of its finest and most sought-after wines. Sadie remains a role model for many new names that have come to Swartland. Along with Adi Badenhorst and, more recently, Chris and Andrea Mullineux, these established figures are showing just what can be done with Syrah, Chenin, Grenache and Mourvèdre and their wines have made Swartland the hottest ticket in town. New names coming on stream like Porseleinberg and David Wines are already showing huge quality. There is, it has to be said, a little fairy dust sprinkled in the air of Swartland. 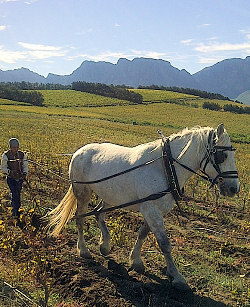 The scenery is beautiful – but probably no more so than so much of the Cape, the winemakers are hardworking and gifted – but then so are many others around the world, and the quality of the wines being produced can reach the pinnacle of South African acheivement – but so too can those from various other Cape regions. But still, there is something magical about the unspoiled landscape and its welcoming little towns. The rustic feel seems to band the community together, and a quiet sense of determination and confidence so obviously lies at the heart of the still fledgling industry here. The Swartland story is set to run and run. The most famous name of Swartland, still leading the pack with terroir-driven wines from ancient vines. The wild man of Swartland, AKA Adi Badenhorst, making a terrific range of authentic wines. An extraordinary new project from Marc Kent of Boekenhoutskloof and winemaker Callie Louw. There’s a real collective mentality in Swartland. The frontier spirit of these pioneers of quality wine production in the region ensuring they work individually, but also as Team Swartland to represent their wines in the world. Here, five members of the ‘Swartland Independent’ group of family wineries presented their wines to me in a speed-dating session. The thriving university town of Stellenbosch is the thumping heart of the Cape winelands. All around it are wine roads leading to some of South Africa’s most ancient and iconic estates: Kanonkop, Rustenberg, Nederburg. It is also home to the industry’s giants, particularly Distell, the brewing, winemaking and distilling business that dwarfs the rest of the industry, and KWV, once a powerhouse of the industry but now having to change and adapt. But any notion that Stellenbosch is resting on its laurels is blown away by the realities on the ground: pace-setting, artisan, organic wineries like the much admired Reyneke or big, brash and super-confident big money start-ups like Delaire-Graff show that not only is this most traditional of wine regions moving with the times, but that it is doing so with confidence. And why not? It is home to some fabulous old-vine material and some of the Cape’s most interesting winemakers. Included in this section is Waterkloof, the only estate I visited in nearby Somerset West. Along with the de Trafford and Tamberskloof wineries, Keermont represents the Blaauwklippen Valley. The Blaauwklippen original still produces some of the Cape’s most thoughtfully conceived wines. Direct descendent of a 17th century Cape wine farmer, Gerard de Villiers has set up this small estate. The Boschendal, Bellingham and Douglas Green labels fall under the DGB group banner. Single vineyards and expressing their different soils drives the thinking of this premium label. Founded in 1705, now part of the giant Distell’s ‘Cape Legends’ portfolio of prime estates. Wines from four estates: Fleur du Cap, Lomond, Plaisir de Merle and Durbanville Hills. The biodynamic vineyards of Reyneke represent a new direction for the Stellenbosch region. The Mulderbosch winery and vineyards have moved lock, stock and barrel under new ownership. Money is no object in this luxury wine estate owned by British jeweller Laurence Graff. Villiera runs one of the Cape’s most socially and environmentally responsible farms. Nearby Somerset West is home to the ground-breaking biodynamic estate of Paul Boutinot.